I have been fortunate to enjoy two spectacular meals at Lincoln Ristorante recently. Chef Jonathan Benno’s food is rooted in the classics yet inventive and full of surprises. I can remember when eating at Lincoln Center was not something worth looking forward to, as there was a dearth of interesting choices in the neighborhood. Jonathan Benno’s Lincoln is one of the more recent additions to a part of town that is now bustling with fabulous restaurants. Benno has spent time in some of the most highly-respected kitchens in the US and France, including Daniel, The French Laundry, Craft, Auberge du Vieux Puits and the Essex House, culminating with six years as Chef de Cuisine at Per Se. Personally, I find it fascinating that a chef with such an illustrious resume would choose the Italian repertoire as the sandbox for his first restaurant, which I believe reflects a wider trend towards food people can eat every day and not just on special occasions. Benno’s take on Italy, while rooted in traditional ingredients and inspired by the classics, is original and quite different from that of other American chefs who work in the Italian vernacular. All I can say is it a real pleasure to dine at Lincoln. I prefer the daytime, when the views of Lincoln Center are captivating. At night, well, when the waiter brings a flashlight to help you read the menu, the room is too dark. Wine Director Aaron Von Rock has put together one of the very best and certainly most creative Italian wine lists in New York City. Sure, you can order Monfortino if the craving strikes and the bank account allows, but there are plenty of more affordable choices that are every bit as satisfying. And if you are looking for some of the cult Italian whites I have written about recently, including wines from Borgo del Tiglio and Miani, you will find them at Lincoln. Dinner starts with Jacquesson’s Brut Cuvée No. 735. To be honest, I was hoping Lincoln would have moved to the No. 736, as I just can’t have enough of that Champagne, but the No. 735 is almost as good. The soft contours, bright fruit and lightly toasted notes make for a delicious, inviting Champagne to drink now and over the next few years. Lincoln’s insalata di frutti di mare (seafood salad) is evocative and delicious, with beautifully articulated flavors that literally jump off the plate. I would gladly order it again. There is less to get excited about in the citrus cured sea trout, which is tasty, but also conventional. One of my go-to rules for food is that I want to have a second taste. That is one of the signatures of a great dish. It is true of the seafood salad and everything else we have on this night, but not the trout. 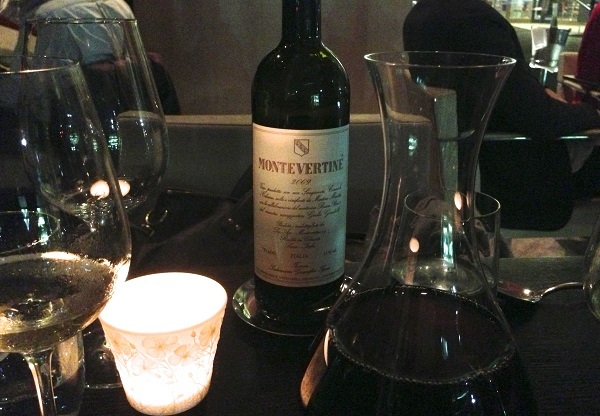 Montevertine’s 2009 Montevertine dazzles from the very first taste. Montevertine is sometimes overlooked in favor of the flagship Pergole Torte, but that is a mistake, as I have learned over the years. The 2009 jumps from the glass with sweet rose petals, red berries, mint, licorice and spices. Is it ready to drink? Of course the 2009 is far too young to be fully mature, but it is still a drop-dead gorgeous beauty. Our two pastas are both sensational. With its combination of seafood and darker, earthier flavors, the strozzapreti al ragù di mare is fabulous and also a great dish for red wine. The smoke flour pasta with pork sausage is even better, especially on a cold, rainy winter night. Tenuta Sella’s 2006 Lessona Omaggio a Quintino Sella is a poignant reminder that we really need to drink more wines from northern Piedmont. Even better than it was last year ago, the 2006 soars out of the glass with a heady mélange of new leather, tobacco, savory herbs, black cherries and spices, all underpinned by bright saline notes that refresh the palate after every taste. The candies and small sweets served with coffee are a nice touch. I confess I have a weak spot for nougat, and Lincoln’s version is hard to resist. Eating at Lincoln Center is no longer an event that needs to be tied to a show. Lincoln Ristorante is worth a visit on its own.